Jerome Masi is a freelance Illustrator and Art Director from France. He graduated in 2001 from Emile Cohl / Lyon School and has been working as a freelancer for 12 years. Today, he is represented by the agency Creasenso / Paris as an illustrator and freelance director. Jerome’s list of clients include AXA, Puma, Orange, SNCF, HOM, Essilor, Klépierre, Castorama, British Airways, Groupe Seb, Hutchinson, Ligne Roset, Nespresso, Tissot, CIC, La Poste, ING Direct, Assurance maladie, la Banque Coopérative, Sage. Weapons of Reason,Gallimard Jeunesse, Harper Collins Edition, Pinguin Random House, Monocle magazine, 01Net, Der Spiegel. Young & Rubicam – Saguez & Partners – Saatchi & Saatchi Littles stories- TBWA / Paris – WAF agency – Babel – DDB Digital – Mullenlowe – Ici Barbés – Agence Change – Lagardére – Havas worldwilde . We are charmed by his collection and we’re impressed with his work. Jerome has lots of amazing creations but we have decided to showcase his YOMONI illustrations. 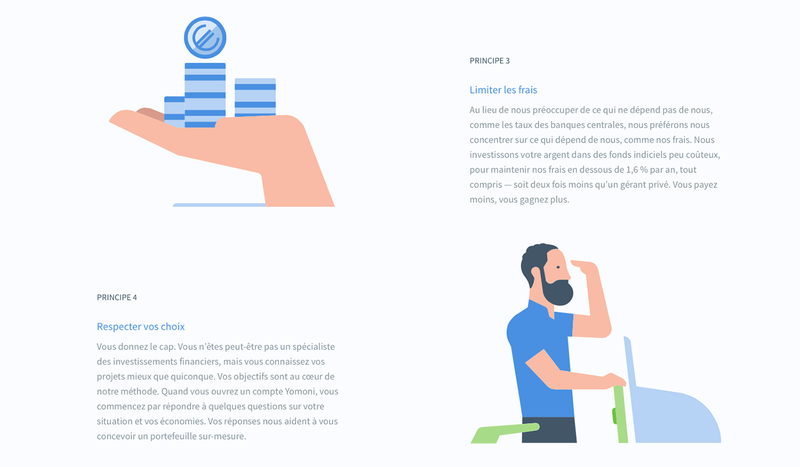 YOMONI, an online savings management service, commissioned him to illustrate their new website.